The sun has just set at the Watsonville Slough. Biologist Gary Kittleson and I are putting on headlamps and waders. We are searching for California red-legged frogs. Kittleson is an expert on the species. He's working with a young tech company that is using sound to find out how many of the frogs remain in the slough. This red-legged frog has had more than it's "15 minutes" of fame. Many believe it was the amphibian in Mark Twain’s first breakthrough short story, "The Celebrated Jumping Frog of Calaveras County." Today, it's listed as threatened under the federal Endangered Species Act and its population numbers continue to decline. Red-legged frogs are the state amphibian and once abounded in California. But in the 19th and 20th centuries they were over-hunted — it seems that people loved to eat their legs. Today these amphibians are losing habitat and are threatened by invasive species like the American bullfrog. Few California red-legged frogs remain. Some years Kittleson says he’d be ecstatic to see just one or two in the slough. The Watsonville Slough in Santa Cruz County provides vital marshland habitat for California red-legged frogs. To get an accurate count of the dwindling population here, scientists like Kittleson are trying something new. They are teaming up with Conservation Metrics, a tech company that specializes in big data and sound. Kittleson, a consulting biologist with a private practice, is the expert on the ground for the project. Over the years he has identified a piece of old farmland in the Watsonville Slough as a hotspot for red-legged frogs. They seem to be drawn to some low-lying ponds once used to raise pigs. The Land Trust of Santa Cruz County owns this piece of land. It is working to save the frogs here by doing things like putting mesh wire around their eggs to protect them from predators. The Land Trust hired Kittleson to do population counts, to see if conservation efforts are working. Kittleson spends a few hours out here at a time, wading through swamp water, peering into brush, and listening for red-legged frogs. Picking out their low calls is no easy task. The slough is rife with chorus frogs, which make repeated, loud, high-pitched calls. The sound is deafening. Kittleson and I have stopped at the edge of a small pool of water. The chorus is all I can hear. Kittleson begins explaining the history of the pond to me, and then abruptly stops. “There was a red-legged frog,” he says. We listen. I hear nothing. “It probably won’t call again because we are talking,” Kittleson says. His ears are so finely tuned, he can hear red-legged frogs even while he talks. Field observation like this is the old way of counting animals. At best Kittleson says you only get a tiny slice of good data -- a sample of a sample of a sample. That's why the Land Trust is partnering with Conservation Metrics. 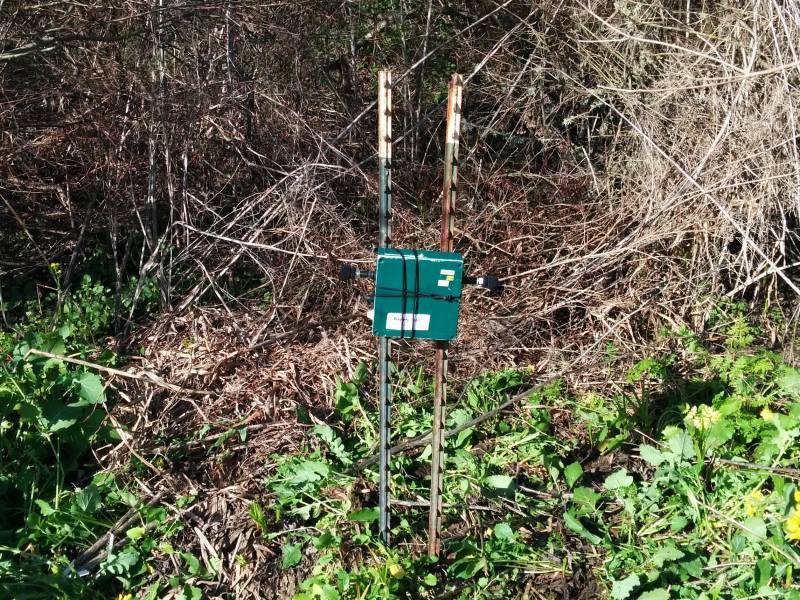 The company has put up song meters, which continuously record the nighttime soundscape. Near the edge of the pond, Kittleson points out one of the recording devices. “There's the song meter, mounted on fence posts,” he says, “It's recording us now.” The green box has microphones protruding from each side. They’re like little ears, capturing everything. So far Conservation Metrics has gathered 1,630 hours of recordings, which translates into 241 gigabytes of data. Down at its office in Santa Cruz, the company turns the recordings into images called spectrograms. 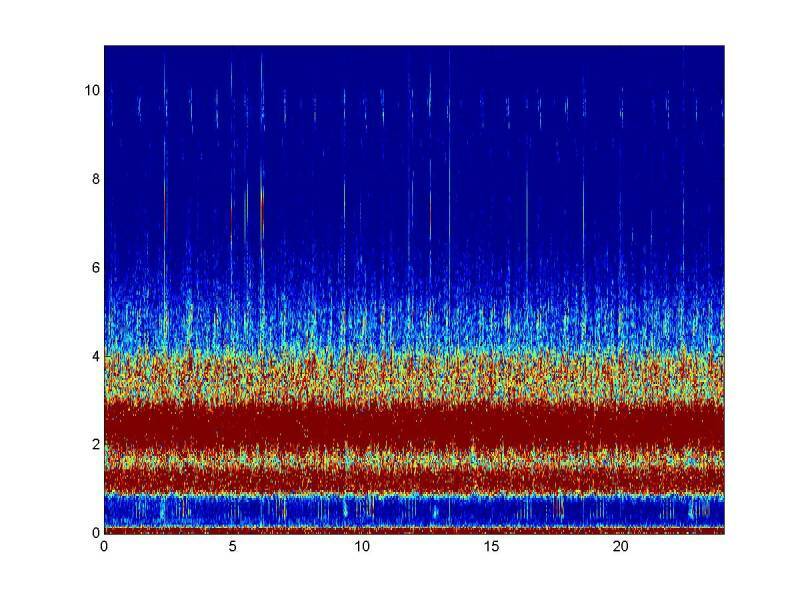 Employee Jeff Schlueter writes algorithms so the computer can sift through hours and hours of audio in the spectrograms and isolate the red-legged frog calls. 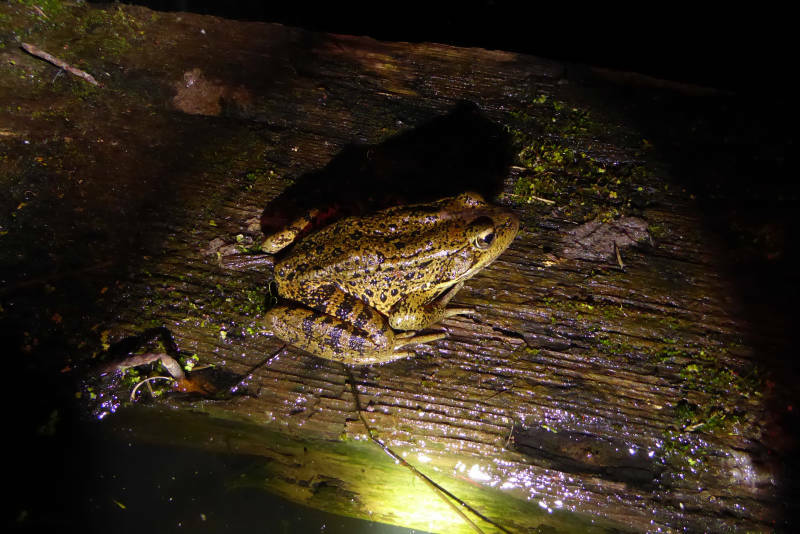 For Conservation Metrics the red-legged frog survey is a relatively small project, more of a pilot program to show its approach can be helpful with a variety of species. 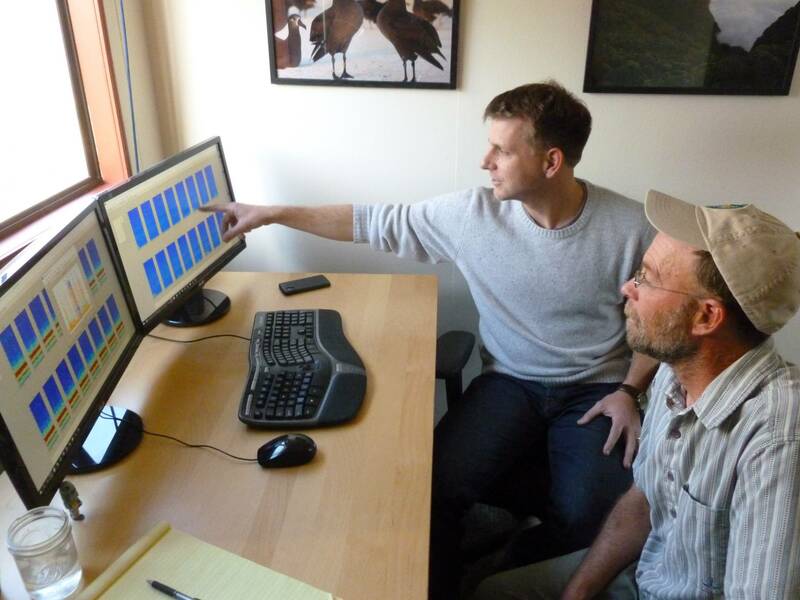 Up until now Conservation Metrics has worked mostly with song birds. This year, the company is running 42 projects in 15 countries, and it is handling about 50 terabytes of data. Using algorithms, one person with a computer can sort through the data for each project and get a population count that would normally take a whole team of field biologists. Matthew McKown founded Conservation Metrics about three years ago after seeing the potential of big data in conservation when he was a graduate student. McKown is capitalizing on the rapidly plummeting cost of gathering and crunching data. He says the conservation world has just recently entered the big data era. Scientists are now collecting and analyzing audio, video, satellite imagery, and GPS data from all kinds of animals like the California condor and the dugong, a threatened relative of the manatee. McKown says surveillance and big data are going to start playing a bigger role in protecting endangered species and threatened habitats. At the marsh near Watsonville, Kittleson says he hopes better data will give us clues about how to save the California red-legged frog. We are now waist-deep in swamp water, sweeping the pond with our headlamps, looking for the glare of frog eyes. And then Kittleson finally spots one. The frog is sitting on a tiny log, floating by the water's edge. Kittleson is not optimistic about the future of the species. It's habitat, which once covered most of California, continues to shrink and its population continues to decline. But Kittleson says getting good data on the number of frogs that remain is the only chance we have to start moving in the right direction.